Bad Juju is an Exotic primary pulse rifle. 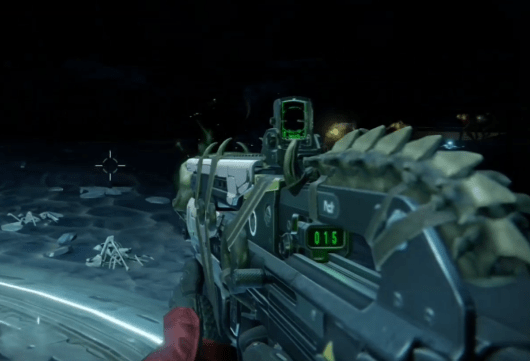 This weapon can only be acquired via its Exotic bounty. The good: Nearly infinite ammo, 2x Super recharge. Conclusion: Very fun, very powerful. Cuts your “bloom” circle by 33%. Causes rounds to penetrate targets. This weapon reloads instantly and increases damage for a short time after each kill. Description: Guardians on vital strike missions have found signs of Toland the Shattered, a once esteemed Warlock whose obsessions led to his exile. The Vanguard would like you to investigate his trail. Complete a heroic or Nightfall Strike to obtain Toland’s Journal [Fragmented]. Bring the journal to Ikora Rey to obtain Toland’s Journal [Fragmented]. Complete 25 Strikes to obtain Toland’s Journal [Encrypted]. Nightfall Strikes counts as 3. Bring the journal to Ikora Rey to obtain Toland’s Journal [Decrypted]. Bring the journal to the Gunsmith to obtain Black Market Coupon. Bring the coupon to Xûr to obtain Darkness-infused weapon frame. Bring the weapon frame to the Gunsmith to obtain Darkness-infused Pulse Rifle. Defeat Guardians in the Crucible to obtain Sated Pulse Rifle. 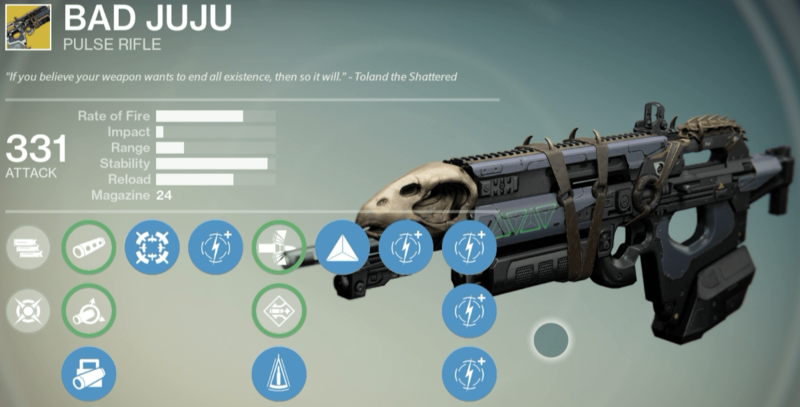 Bad Juju is a primary pulse rifle rifle that can be obtained through its Exotic bounty, which is outlined above. Before the Exotic patch, Bad Juju was a mess and barely used because it just wasn’t useful enough. It’s now one of the best PvE primary weapons in the game. Bad Juju is really built around the String of Curses perk, ans the update added the ability to increase your Super energy on kills to it. Now in addition to automatically reloading the weapon on a kill, and increasing damage on a kill, it will now bring your super energy up a bit quicker. Your Super meter will fill up twice as fast, and even faster if you’re benefiting from the Inverse Shadow armor perk and/or high intellect. It will take about 15 kills to fill up your meter. 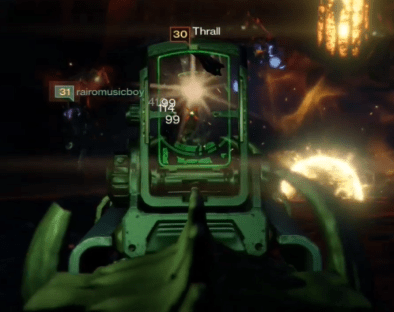 String of Curses really starts to shine in swarm encounters like the first area in the Crota’s End raid. Since you almost never need to reload, you’ll save a lot of time and be all the more deadly because of it. When the weapon reloads it doesn’t take ammo from your reserve, which means you are never going to run out of ammo as long as you keep landing the killing blow on targets. The magazine size was also upgraded in the patch, increasing it to 24 rounds. This is a great reprieve from the 15 round magazine size that it used to have. With the high rate of fire, you can actually miss a burst or two and not feel punished for it. This weapon also fires in full auto. The high fire rate, plus full auto allows for some very quick damage on enemies, especially if you are able to land all those as precision shots. For Warlocks, Bad Juju is a necessary addition to their arsenal. With the Obsidian Mind helm, plus the Energy Drain, Soul Rip, and Embrace the Void talents, you’re going to be able to use grenades and Nova Bomb a lot more than normal. The 1 thing that really keeps this weapon from ascending into the top tier of exotics is its low impact rating. This really becomes an issue when facing anything above a tier one enemy. You take too many shots to bring them down, even if you are only landing headshots. Pulse rifles aren’t very strong in PvP as it is, and the low impact really hurts it. In PvE it’s going to take about 6-8 bursts to take down an enemy, less with the damage buff active. Iv PvP, shots to the body are 16 and headshots are 24, which means you’ll need to work for every kill. You have to perfectly line up your recoil, and if you have the skill to do that, you should go with a scout rifle or hand cannon. String of Curses requires you get the killing blow, and that’s sometimes more difficult in PvP. Furthermore, if you’re playing in a group in PvE, then it also becomes slightly more difficult to ensure you land killing blows. The perks don’t really allow for a lot of customization either. To make the most of the weapon you want to kill things as quick as possible, which means you want your shots to all land on precision points. Going with higher stability is the best way to go about this, though “Send It” is worth trying out too if you think you need the Range. Bad Juju‘s cosmetics received a tweak to the particle effect on the front of the gun so it no longer interferes with the normal handling of the weapon. The other cosmetics are unchanged. The sights are still crisp and bright, and the sound is interesting. Its overall look and feel looks great, on your back or in the Tower; it truly looks Exotic. Despite the low impact and lack of upgrade options, Bad Juju is a weapon that is not only really fun to use, but extremely powerful in the right situations. A high intellect build in PvE can yield very fun results, especially a Void Walker with the Obsidian Mind. If there are a lot of tier 2 enemies then it would be best to just switch to a weapon with higher impact. If you find yourself with this Exotic bounty, it’s worth completing. For PvP this weapon earns a 8.9/10 and for PvE a 8.8/10.